In the face of government investigations, public outrage, and bankruptcy, companies like ExxonMobil, Koch Industries, and Peabody Energy are plotting their self-defense strategies at the American Legislative Exchange Council's 2016 annual meeting in Indianapolis, Indiana. This month, 19 United States Senators called attention to the Web of Denial, a network of front groups that oppose any productive action to combat climate change. 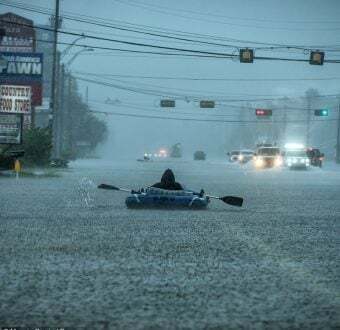 Senator Sheldon Whitehouse (D-RI) led the charge, building upon his weekly “Time To Wake Up” speech series on global warming, flagging the front groups that peddle climate doubt for their clients in the oil, gas and coal industries. One of the top groups obstructing any form of progress is the American Legislative Exchange Council, or ALEC. 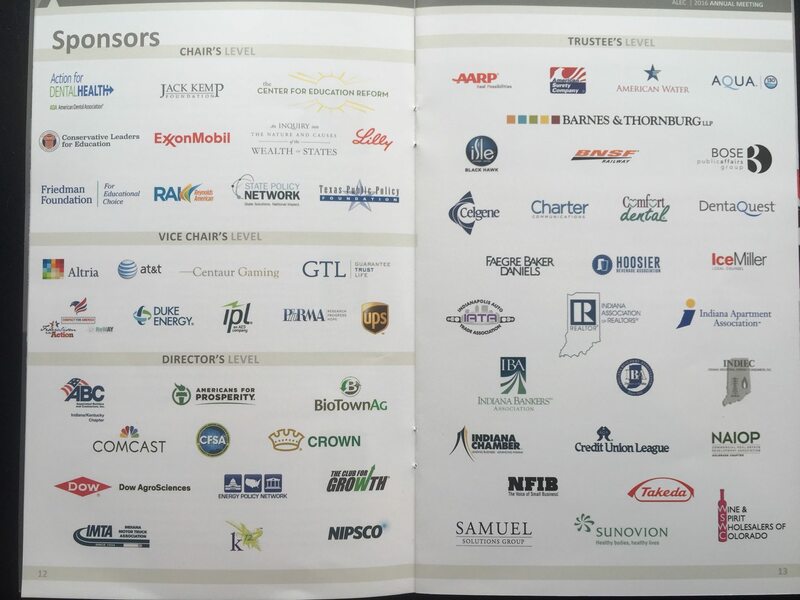 ALEC convened its annual meeting in Indianapolis this week, where it hooks state politicians up with lobbyists from Koch Industries (and its many nonprofit tentacles), Peabody Energy, tobacco companies, pharmaceutical companies and other industries looking to put pro-business policies in the hands of state politicians. 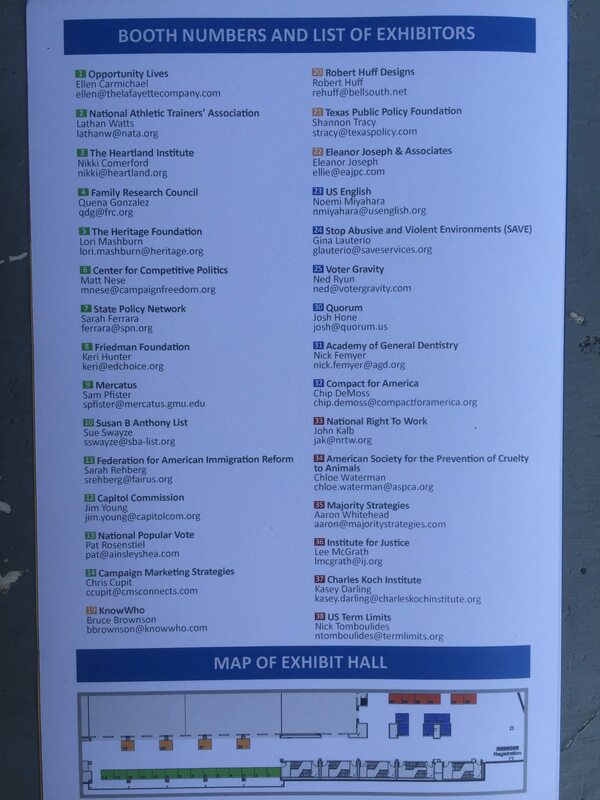 List of Exhibitors at ALEC 2016 annual meeting. All of these groups are members of the State Policy Network, the coordinating body for “Stink Tanks” that exist in all 50 states, largely following the strategies of national affiliates like the Heritage Foundation and Americans for Prosperity. Each of the SPN groups present at ALEC’s meeting this week have received support from the industrial billionaire Charles Koch, and his brother David Koch, who together own and run Koch Industries. Nonprofit foundations controlled by the Kochs have distributed $23,445,693 to ALEC and the six other groups listed above, from 1997-2014, according to IRS 990 data compiled by Greenpeace USA. Koch Industries lobbyist Mike Morgan is on ALEC’s corporate board of directors. Koch Industries has given over $14 million to politicians, PACs and initiatives at the state level over the last 21 years, according disclosures compiled by FollowTheMoney.org. Believe it or not, $23.4 million in traceable Koch money is chump change compared to grants from the double-headed “Dark Money ATM,” DonorsTrust and Donors Capital Fund. Since 2002, the DonorsTrust franchise dispersed $77,361,091 in anonymous funds to ALEC, AFP, Heritage, Heartland, Mercatus, SPN and TPPF. The Koch family is among the donors known to anonymize millions of dollars through DonorsTrust and Donors Capital Fund. ExxonMobil gave these same seven organizations a total $3,696,700 since 1998. ExxonMobil lobbyist Cynthia Bergman White is on ALEC’s corporate board of directors, as were other Exxon executives before her. Exxon has poured $71.6 million into state-level candidates and ballot initiatives over the last 27 years. Peabody Energy’s recent bankruptcy filings list several of these groups on the company’s payroll: ALEC, AFP Oklahoma, SPN and TPPF. Peabody lobbyist Michael Blank is on ALEC’s corporate board, as were other Peabody executives before him. Peabody pushed $1.1 million into state-level elections in the last 19 years, before it went bankrupt. And finally, another front group with Peabody roots is among ALEC’s 2016 annual meeting sponsors: the Energy Policy Network, formed by the late Kelly Mader. Mr. Mader was a lobbyist for Peabody Energy, and he served on ALEC’s corporate board of directors for many years. Peabody continued to give money to Mr. Mader after he left the company. 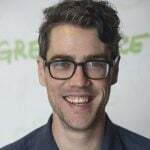 It is unclear if those funds were for the Energy Policy Network, and what will become of it after Mr. Mader’s unexpected passing. #ExxonKnew the Science on Climate Change. Then It Lied. Then ALEC Helped. Exxon is being investigated by several state attorneys general for covering up its own internal research on climate change, and then financing groups to run public relation campaigns aimed at discrediting such science. By hiding their own accurate assessment of the science and instead promoting doubt, these state AGs are asking if Exxon has committed fraud against its shareholders, the U.S. government, and the public. ALEC politicians are treated to industry-sponsored education seminars (ALEC charges extra for that), and closed-door policy meetings, where ALEC’s model bills are discussed and finalized. Legislators have received their climate science “education” at ALEC meetings, not by climate scientists, but by front groups in the coal- and oil-funded Web of Denial. The other primary service ALEC provides to sponsors is getting model bills into the hands of willing legislators. Aliya Haq at the Natural Resources Defense Council has observed ALEC politicians following Peabody’s lead in attacking a wide variety regulations designed to limit pollution and greenhouse gas emissions. Citizens of Kansas, Ohio, and North Carolina watched as ALEC politicians lined up behind Koch Industries’ attacks on state laws boosting clean energy development. And numerous states were duped by ALEC legislators helping ExxonMobil hide the chemicals used in fracking from the public (which ALEC spun as a “disclosure” bill). Not at the table to discuss these cut-and-paste state policies: the American voter. As I’ve pointed out to various lobbyists attending ALEC’s meeting, even if a citizen finds out about ALEC, it doesn’t mean they can afford ALEC’s registration fees, travel expenses, and time off of work to attend. Easy for a paid lobbyists to say, when it’s their job to attend such conferences. Having activism reframed as lobbying (by lobbyists) is one form of pushback groups like Greenpeace USA are accustomed to. Another is attempts to re-define the FIrst Amendment, something that every American holds dear as a fundamental right. Just as the tobacco industry did during its last stand against prosecutors in the 1990s, Exxon and its many #WebOfDenial mouthpieces have asserted this is a violation of their first amendment rights, even though fraud isn’t protected by the first amendment. Many of these people and groups were actually involved in defending the tobacco industry, before climate science denial became the latest trend in corporate deceit. Yesterday, ALEC hosted a discussion on this revisionist approach to the First Amendment. The conversation appears to be intended to coordinate defensive strategies for companies like Exxon–subject to government investigations–and groups like ALEC–which has been the subject of repeated complaints to the IRS over improper use of its nonprofit tax-exempt status. 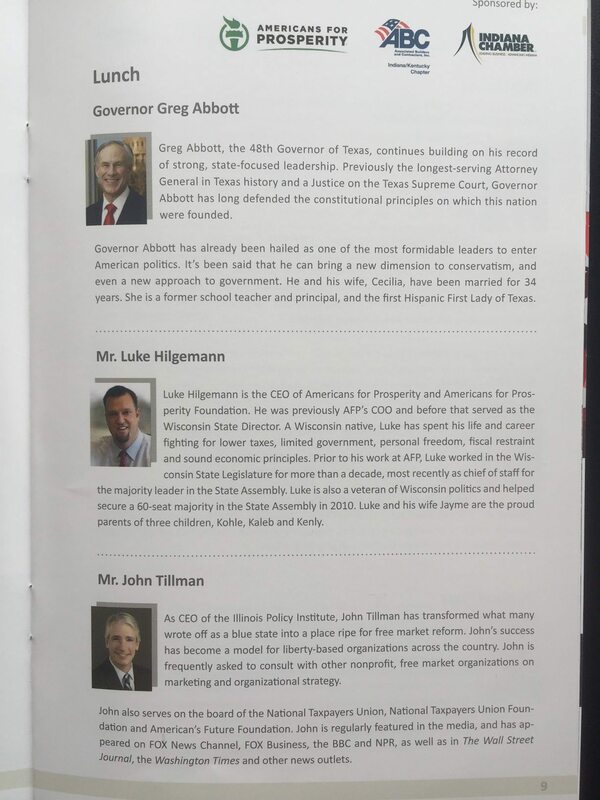 And yesterday’s lunch, sponsored by Americans For Prosperity, featured Texas Gov Greg Abbott, who attended remotely via video. Governor Abbott, who himself sued the U.S. Environmental Protection Agency many times as Texas’ former Attorney General, is part of a coalition of states working with fossil fuel companies–and their front groups like ALEC and AFP — to oppose the EPA’s new regulations on climate pollution.